Mademoiselle Mathilde Stangerson is attacked in her yellow bedroom by a murderer wielding a mutton-bone. When her father and the other people in the house break down the door, Mlle S is on the floor and her murderer is nowhere to be found. There are three exceedingly strange things about this – one: how did the murderer get out of a room in which the only door and window were securely locked; and two: why does everyone keep calling him a murderer when Mlle S is still alive…; and three: a mutton-bone??? OK, to my great disappointment I discovered a mutton-bone is actually the name given to a club-like weapon much used by villains of the day, so that solves number three. Number 2 – the murderer with the living victim – becomes progressively more hysterical as the book goes on and Mlle S stubbornly refuses to die. I couldn’t help wondering what she felt every time a newspaper or one of the characters talked about her murder. The real meat of the thing, though, is not on the mutton-bone, but in the question of how the murderer got out of the room. Enter our hero, Joseph Rouletabille, (a nickname meaning “Roll Your Marble”, given to him, presumably, on account of his large round red head), a young journalist who at the age of eighteen has already acquired a reputation as an inspired amateur detective. 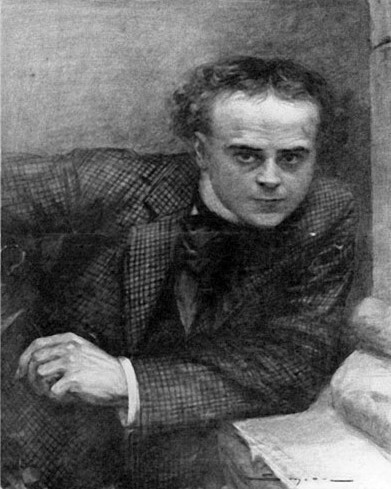 He is introduced to us by our narrator, Jean Sainclair, a young lawyer and friend who acts as Rouletabille’s sidekick. Off they go to the Château du Glandier, where they will meet Mathilde and her father, her fiance, her loyal and devoted servant, and various assorted estate workers and villagers, all with or without alibis and motives, and all behaving suspiciously in one way or another. Even Frédéric Larsan, famed investigator of the Sûreté, will find himself hard put to it to come up with a solution to this baffling mystery, and when he does, it will be entirely different from Rouletabille’s solution. Who will prove to be right? And how will he (the one who’s right) prove he’s right? And will they catch the murderer before the murder victim is finally murdered??? This is a fabulous little romp that is more and more fun as it goes along. First published in French in 1907, I can’t find anything to tell me who the translator was. At first, I felt the language was quite stilted and thought it could do with a modern update. But as the book’s general mildly melodramatic tone began to come through, I realised the style of the translation is actually perfect for it. It makes it feel terribly French and very old-fashioned – both things which add considerably to its charm. The plotting is great, enhanced by a couple of detailed floor plans allowing the reader to try to get to the solution before Rouletabille. (I failed miserably!) The initial mystery of the locked room is only one of the “impossible crime” features – there is another halfway through which is not only baffling but quite spooky, and there are other sections where Leroux creates a beautifully tense atmosphere. But overall the book leans more towards entertainment with lots of humour, especially in the rivalry between Rouletabille and Larsan. I love that the title of the first chapter is In Which We Begin Not to Understand – sets the light-hearted tone superbly before the book even begins. The villagers are about as welcoming as the ones in The Wicker Man, complete with a surly publican and a witchy old crone with an exceptionally scary cat called Bête du Bon Dieu, so some lovely almost Gothic touches sprinkled into the story. … and Poirot (and Ms Christie) knew a thing or two about crime fiction. Poirot is not Rouletabille’s only admirer among the fictional detective classes – John Dickson Carr’s Gideon Fell refers to the book as “the best detective tale ever written”. I must say the physical book from the Collins Crime Club series is gorgeous too, with a great cover, including quotes from Poirot and Fell where normally there would be puffs from fellow writers. Made me laugh with delight before I even opened it. I’m so glad to have had the chance to read this one, since I’ve seen it referred to often in my recent travels through vintage crime. And I’m even more glad to be able to say that I feel it fully deserves its reputation, both for the skill in the plotting and for the entertainment value in the storytelling. An essential read for vintage crime fans! I’m so glad you liked this one, FictionFan! And I really do like that great connection between it and The Clocks. Christie knew her books… I just keep coming back to that point that the good mademoiselle is simply not dead – I love it! You make an interesting point about the translation, too. That’s one of the often-overlooked aspects of a fine novel. It’s not easy to convey the spirit of a book in another language. In fact, sometimes a book that’s excellent in the original language falls absolutely flat when it’s translated, because the translation just wasn’t done well. I’m glad it worked for you here. It’s nice to know that Christie mentioned a real book, and that the book turned out to be good. I also would have liked the weapon to be an actual mutton bone of sorts. Glad also that the tone of book comes through the translation. Very tricky to do. Flabbergasted to find there is a copy in my local small town Australian country public library! Will be borrowing tomorrow morning. 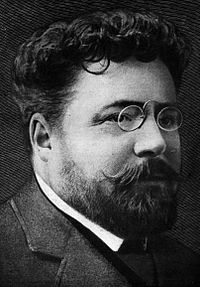 Is Gaston Leroux the author of the original Phantom of the Opera novel?. I’m disappointed about the mutton-bone, but perhaps Leroux’s is happier for a vegetarian reader…. Well, I may be feeling a bit more Tiggerish (I went away on a sadly short silent retreat – which was brill – but the work mountain is still staggering. I have time to read OR review, but not quite for both – spending too much time on PC with work admin, – my TBR pile is diminishing at the rate of knots – as the to be REVIEWED pile rises at the same rate as the other falls…. Hope it all gets a bit less stressful soon! Yes, reviewing does rather eat into reading time – I seem to read less every year (as my reviews grow ever longer!). But if I don’t review within a reasonable time I forget too much to be able to cobble something coherent together. In fact, I was just thinking I’m going to have RE-READ one I’ve left too long… !! I thought this was a brilliant mystery. As you say – baffling. Sounds like a must-read to me, FF!! Thanks for piquing my interest with your excellent review. I’ll try to get my hands on a copy! That IS disappointing about the mutton-bone. I had such a picture in my mind. For 99 cents, and after THAT review, I had to pick it up! I’m not sure I’ve read much vintage crime, or not enough of it anyway. Wonderful review, FF! Absolutely fabulous. Thank you! 😀 Oh, I do hope you enjoy it! I’m loving reading vintage crime at the moment – so many great books are being re-issued. So glad you enjoyed this one – I loved it, and the Phantom, not so quirky, but lots of melodrama! It’s great, isn’t it? I must read the Phantom sometime, and apparently there’s a follow-up to this one too which I shall have to see if I can acquire – The Perfume of the Lady in Black. Have you read it? Yes , there is actually a series (of six? books, if I remember rightly). I’ve read them all – in French! – a long time ago. I’m going to reread “Yellow”, but in English this time. That’s a terrific review, FF. I was totally thinking that the murder weapon was a giant animal bone until you informed me otherwise! The Gothic elements sound appealing too. Thank you! 😀 Haha – we’re all so disappointed about the mutton-bone I really think someone needs to write a book where a real one IS the weapon! Yes, the gothic stuff was fun – especially the scary cat! I have an ebook copy of this but the physical one you reviewed sounds pretty gorgeous. Glad to hear it lived up to its reputation for you! I must say the physical book is lovely. I was thinking it would be a perfect gift for any vintage crime fans, even if they’d read it before. And now at least I’ll understand why it has such a stellar reputation next time I see it mentioned! Great review! This book sounds too much fun not to add to the list. I loved everything about this review, from your plot synopsis to your three questions to your inclusion of the fictional detectives’ blurbs. You really gave the whole book a complete package feel that made me giddy. And the meat jokes. Oh, how they kept coming! The premise of the “how did he get in the room” reminded me! I just watched Hitchcock’s Dial M for Murder for the first time this weekend. I loved it. I wanted to see it because I remembered reading in Joan Fontain’s autobiography that she was in the PLAY version for ages, and they eventually traveled the show around. Grace Kelly was amazing in the film version, but I can easily imagine Fontaine in it, too (even though I think she was a stinker in real life). I love Dial M for Murder and rewatched it quite recently. I’ve also seen it done in the theatre, though not with Joan – I’m not quite that old! But I think it works better on film, though that might just be because the production I saw didn’t have great actors in it – they were fine, but not special. Once you understand how Hitchcock works, I think half the fun of seeing his movies is watching for things like the camera angles, the light changes, and the focus on the actors’ eyes. He does a lot with weird angles in Dial M.
I’m so bad for not consciously noticing stuff like that though I guess it must affect me subliminally or I probably wouldn’t enjoy him so much. He was also a genius at casting though, and that’s why I think it’s hard to see other people in the roles. Your first sentence had me convinced 😀 I’m disappointed its not an actual mutton bone though! As a fellow vintage fan, you will love this one! Haha – I’m starting a campaign to get an author to write one with a mutton-bone as weapon! That’s a great review, and I thought it was only me who could not find the translator. I did not realise Poirot read it inside one of Christie’s books. That is interesting, and I like how he says that truth is concealed with a cunning use of words. That is what it was all about in a way. Even our idols have their own idols. Thank you! 😀 I had just read The Clocks a couple of months before reading this one so was delighted to read the book Poirot had praised so highly! The more I read of all the intros to these golden age crime novels, the more I realise what an interconnected lot they were and how they often referenced each other in their books. A nice touch!